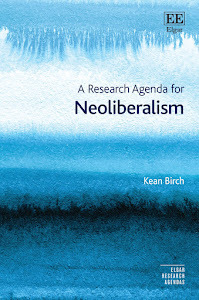 Birch, K. (2019) Neoliberal Bio-economies? The Co-construction of Markets and Natures. Basingstoke: Palgrave Macmillan. Birch, K. et al. (2017) Business and Society: A Critical Introduction, London: Zed Books. Birch, K. (2016) Innovation, Regional Development and the Life Sciences: Beyond Clusters, London: Routledge. Springer, S., Birch, K. and MacLeavy, J. (eds) (2016) The Handbook of Neoliberalism, London: Routledge. Birch, K. (2015) We Have Never Been Neoliberal: A Manifesto for a Doomed Youth, Winchester: Zer0 Books. Birch, K. and Springer, S. (forthcoming 2019) Peak neoliberalism? Revisiting and rethinking neoliberalism as a concept, ephemera: theory & politics in organization 19(3) [open access]. Birch, K. (2017) Introduction: Techno-economic assumptions, Science as Culture 26(4): 433-444 [free access]. Birch, K. (2017) Commentary: Towards a theory of rentiership, Dialogues in Human Geography 7(1): 109-111. Erciyas, K. et al. (2015) Editorial: Dentomics and One Health, OMICS: A Journal of Integrative Biology 19(3): 145-146. Özdemir, V., Dandara, C., Hekim, N., Birch, K., Springer, S., Kunej, T. and Endreny, L. (2017) Stop the spam! Conference ethics and decoding the subtext in post-truth science: What would Denis Diderot say?, OMICS: A Journal of Integrative Biology 21(11): 658-664. Birch, K. (2017) The problem of bio-concepts: Biopolitics, bio-economy and the political economy of nothing, Cultural Studies of Science Education 12: 915-927. Birch, K. (2016) Materiality and sustainability transitions: Integrating climate change into transport infrastructure in Ontario, Canada, Prometheus: Critical Studies in Innovation 34(3-4): 191-206. Birch, K. (2016) Emergent policy imaginaries and fragmented policy frameworks in the Canadian bio-economy, Sustainability 8(10): 1-16 [Open Access]. Birch, K. and Siemiatycki, M. (2016) Neoliberalism and the geographies of marketization: The entangling of state and markets, Progress in Human Geography 40(2): 177-198. Birch, K., Dove, E., Chiappetta, M. and Gursoy, U. (2016) Biobanks in oral health: Promises and implications of 'post-neoliberal' patterns of science and innovation, OMICS: A Journal of Integrative Biology 20(1): 36-41. Dove, E. et al. (2015) An appeal to the global health community for a tripartite innovation: An “Essential Diagnostics List,” “Health in All Policies,” and “See-Through 21st Century Science and Ethics”, OMICS: A Journal of Integrative Biology 19(8). Birch, K. (2015) Neoliberalism: The whys and wherefores ... and future directions, Sociology Compass 9(7): 571-584. Birch, K. (2012) Review essay: An open biotechnology revolution?, Science as Culture 21(3): 415-419. Birch, K. (2012) Knowledge, place and power: Geographies of value in the bioeconomy, New Genetics and Society 31(2): 183-201. Birch, K. (2011) "Weakness" as "strength" in the Scottish life sciences: Institutional embedding of knowledge-based commodity chains in a less-favoured region, Growth and Change 42(1): 71-96. Birch, K. and Cumbers, A. (2010) Knowledge, space and economic governance: The implications of knowledge-based commodity chains for less-favoured regions, Environment and Planning A 42(11): 2581-2601. Birch, K., MacKinnon, D. and Cumbers, A. (2010) Old industrial regions in Europe: A comparative assessment of economic performance, Regional Studies 44(1): 35-53. Birch, K. (2009) The knowledge-space dynamic in the UK bioeconomy, Area 41(3): 273–284. Pike, A., Birch, K., Cumbers, A., MacKinnon, D. and McMaster, R. (2009) Rejoinder: A geographical political economy of evolution in economic geography, Economic Geography 85(2): 175-182 [Symposium, Evolutionary Economic Geography]. Birch, K. and Whittam, G. (2008) Critical survey: The third sector and the regional development of social capital, Regional Studies 42(3): 437-450. Birch, K. (2007) Knowledge, space and biotechnology, Geography Compass 1(5): 1097-1117. Birch, K. (2005) Beneficence, determinism and justice: An engagement with the argument for the genetic selection of intelligence, Bioethics 19(1): 12-28. Calvert, K., Birch, K. and Mabee, W. (2017) New perspectives on an old energy resource: Biomass and emerging bio-economies, in S. Bouzarovski, M. Pasqualetti and V. Castan Broto (eds), The Routledge Research Companion to Energy Geographies, London: Routledge, pp.47-60. Birch, K. (2017) Financing technoscience: Finance, assetization and rentiership, in D. Tyfield, R. Lave, S. Randalls and C. Thorpe (eds), The Routledge Handbook of the Political Economy of Science, London: Routledge, pp.169-181. Springer, S., Birch, K. and MacLeavy, J. (2016) An introduction to neoliberalism, in Springer, S., Birch, K. and MacLeavy, J. (eds) The Handbook of Neoliberalism. London: Routledge, pp.1-14. Birch, K. (2016) Financial economics and business schools: Legitimating corporate monopoly, reproducing neoliberalism?, in Springer, S., Birch, K. and MacLeavy, J. (eds) The Handbook of Neoliberalism. London: Routledge, pp.320-330. Birch, K. and Wudrich, D. (2015) (Re)building sustainable infrastructure: The implications for engineers, in C. Lipsig-Mumme and S. McBride (eds) Work in a Warming World, Montreal: McGill-Queen's University Press, pp.125-141. Birch, K. and Whittam, G. (2012) Social entrepreneurship, in Entrepreneurship and Small Firms by D. Deakins and M. Freel. Maidenhead: McGraw-Hill (6th Edition) [Revised chapter], pp.105-123. Birch, K. and Cumbers, A. (2012) Industrial transition in knowledge-based sectors: Changing economic governance and institutional arrangements in the Scottish life sciences, in Industrial Transition. New Global-Local Patterns of Production, Work, and Innovation by M.Fromhold-Eisebith and M. Fuchs (eds). Farnham: Ashgate, pp.99-115. Birch, K. and Cumbers, A. (2011) Alliance-driven governance in Scottish life science commodity chains and its contribution to regional development, in International Entrepreneurship: Business Ventures in Life Sciences by M. Jones, C. Wheeler and P. Dimitratos (eds). Cheltenham: Edward Elgar, pp.139-155. Whittam, G. and Birch, K. (2011) Market madness or the road to salvation? A critical review of the social enterprise agenda, in Enterprise, Deprivation and Social Exclusion: The Role of Small Business in Addressing Social and Economic Inequalities by A. Southern (ed.). London: Routledge, pp.239-253. Mykhnenko, V. and Birch, K. (2010) Conclusion: The end of an economic order?, in The Rise and Fall of Neoliberalism by K. Birch and V. Mykhnenko (eds). London: Zed Books, pp.255-268. Birch, K. and Tickell, A. (2010) Making neoliberal order in the United States, in The Rise and Fall of Neoliberalism by K. Birch and V. Mykhnenko (eds). London: Zed Books, pp.42-59. Birch, K. and Whittam, G. (2009) Social entrepreneurship, in Entrepreneurship and Small Firms by D. Deakins and M. Freel. Maidenhead: McGraw-Hill (5th Edition), pp.248-264. Birch, K. (2007) The knowledge-space dynamic in the British biotechnology industry: Function, relation and association, in Creative Regions: Technology, Culture and Knowledge Entrepreneurship by P. Cooke and D. Schwartz (eds). London: Routledge, pp.148-168. Birch, K. (2007) The social construction of the biotech industry, in New Genetics, New Social Formations by P. Glasner, P. Atkinson and H. Greenslade (eds). London: Routledge, pp.94-113. Clinical Labor (2014) by M. Cooper and C. Waldby, New Genetics and Society 34(4) 2015: 444-446. The Modern State Subverted: Risk and the Deconstruction of Solidarity (2014) by Giuseppe di Palma, Review of Politics 77(2) 2015: 330-332. Austerity: The History of a Dangerous Idea (2013) by M. Blyth, Journal of Cultural Economy 7(4) 2014: 524-526. Constructing Neoliberalism: Economic Transformation in Anglo-American Democracies (2013) by J. Swarts, International Studies Review 16(4) 2014: 647-649. Economic Globalisation as Religious War: Tragic Convergence (2007) by M. McKinley, Totalitarian Movements and Political Religions 9(4) 2008: 605-606. The Changing Economic Geography of Globalization (2006) by G. Vertova (ed. ), Economic Geography 84(2) 2008: 243-244. Growth cultures: the global bioeconomy and its bioregions (2007) by P. Cooke, Journal of Economic Geography 8(2) 2008: 265-266. Regional Development in the Knowledge Economy (2006) by P. Cooke and A. Piccaluga (eds), Urban Studies 44(8) 2007: 1622-1623. Biocapital (2006) by K. Sunder Rajan, American Journal of Bioethics 7(6) 2007: 67-69. Making People Behave (2005) by E. Burney, Urban Studies 43(9) 2006: 1650-1652. Why Did They Kill? Cambodia in the Shadow of Genocide (2005) by A. Hinton, Totalitarian Movements and Political Religions 7(3) 2006: 393-394. “A Problem from Hell”: America and the Age of Genocide (2003) by S. Power, Totalitarian Movements and Political Religions 6(3) 2005: 427-8. Ethics and the Business of Bioscience (2004) by M. L. Eaton, American Journal of Bioethics 5(4) 2005: 58-60. Nazi Medicine and the Nuremberg Trials (2004) by P. Weindling, Totalitarian Movements and Political Religions 6(1) 2005: 159-160. Hungry Corporations (2003) by H. Paul and R. Steinbrecher, New Genetics and Society 23(3) 2004: 328-9.